Ginataang tilapia or tilapia with coconut milk is a popular tilapia dish. This is a kind of fish stew cooked in coconut milk with a little vinegar and onion, garlic, ginger, finger chili and of course the pechay. Other ginataang tilapia recipe doesn’t use vinegar. But the advantage of using vinegar will lessen the fishy odor and taste. It will also improve the taste of the dish. 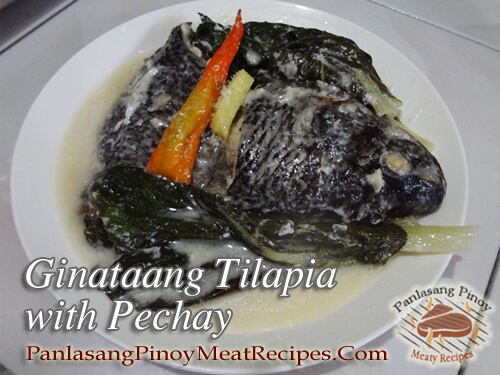 To cook ginataang tilapia with pechay; Put tilapia in a pot and add salt. Add the garlic, onions and ginger. Then pour the vinegar. Turn on heat and bring to a boil. Boil for 5 minutes and cover. After 5 minutes, add pechay put on top of the fish. Add finger chilies then pour the coconut milk. Cover and continue boiling until the sauce is reduce to half or until thick. Ginataang tilapia or tilapia with coconut milk is a popular tilapia dish. Put tilapia in a pot and add salt. Add the garlic, onions and ginger. Then pour the vinegar. Turn on heat and bring to a boil. Boil for 5 minutes and cover. After 5 minutes, add pechay put on top of the fish. Add finger chilies then pour the coconut milk. Cover and continue boiling until the sauce is reduce to half or until thick. Season with ground black pepper if desired. Serve hot. Hi Gloria, Yes, sure you can use tilapia fillet.